Below is a series of articles from the Fleet 13 Website on building a US spec. 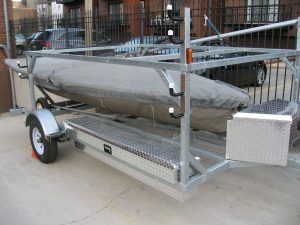 custom 505 double trailer. This project was completed in May 2011. Sno Bird trailers did a great job building this rig, and it was quite reasonable versus importing a Rapide. The other advantage is that it uses standard parts, bearings, lights, etc. that are commonly available in the US. 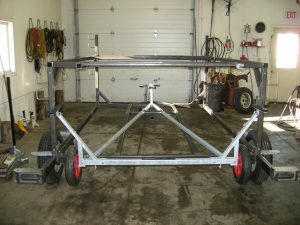 One design related change that we would make if we were to do it again is to re-work the frame in an effort to tuck the trailer wheels further inboard. This rig is just a bit wider than ideal, however it still rides very nicely. Since I’ve added a second boat for this year, I decided that it would probably be a good thing to have a trailer with which I could move my boats. Because any existing trailer would have to come from a few thousand miles away and the fact that Fleet 13 has never been impressed with any of the production doubles, we decided to go with a custom rig. Craig and Evan Thompson have been instrumental in getting the details of the design sorted out and I am very thankful for their help. 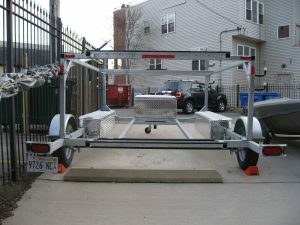 We’ve been working with Snobird Trailers in Slinger, WI. These guys have been incredibly helpful and based on my visit yesterday look to have executed the build to a high standard. The trailer has yet to be galvanized, but once that is done we’ll be adding a pair of Tradesman side mount boxes on the length-wise members and a tongue box on the forward triangle. We’ll also be adding some 1/2″ Delrin plastic on the cross bars to allow the dollies to easily slide onto the trailer. Snobird is also going to weld on some pieces of angle to limit the side-to-side movement of the dollies as well as some pad-eyes for ratchet straps. This trailer is very heavy duty and we’re quite pleased with that. It can also accommodate any type of dolly, providing welcome flexibility. We’ll be posting details of the finished product next month. I’m pretty stoked about this unit and I have to again thank Craig and Evan Thompson for all of their contributions to and help with the project. Also, thanks to Sno Bird Trailers for delivering an excellent product.